With its affordable neighborhoods and family-friendly communities, Southwest Dallas is an ideal place to relocate. Home to top-notch communities such as Oak Cliff and South Dallas, this part of the city offers something for everyone. The area offers a reasonable cost of living, quality homes for sale, excellent public schools, family-friendly neighborhoods and easy access to local highways, Dallas-Fort Worth International Airport and DART light rail. Whether you’re a commuter to Downtown Dallas, growing family, young professional, empty-nester or just about anyone else in between, you’re sure to find that Southwest Dallas has plenty of outstanding real estate and property options. Homes for sale in Southwest Dallas enjoy prices below the national average, not to mention solid property values and convenient proximity to Downtown Dallas. Real estate options offer something for everyone in Southwest Dallas, from charming single-family homes to affordable starter homes to convenient townhouses. With their competitive prices, prime location and wealth of style and design options, Southwest Dallas is a superb choices for all sorts of homebuyers. The Southwest Dallas area was first settled in the middle of the 19th century. Like the rest of the city, it boomed with the rising railroad and agricultural trade of the era and saw rapid growth in the years following the Second World War. Today the area continues to enjoy strong growth as many new families are drawn to its high quality of life, affordable real estate options and quality property choices. The area offers a rich array of local parks and public spaces to explore, the most famous of which is Fair Park. In addition, the area is convenient to many other parks and public spaces in the city such as the Katy Trail, White Rock Lake, Bachman Lake and a host of other beautiful parks. Southwest Dallas is home to a host of local attractions and sites of interest such as Fair Park, the Bishop Arts District and Exposition Park. It’s also very convenient to many of the city’s other top attractions such as the Dallas Museum of Art, the Perot Museum of Nature and Science, the Dallas Zoo, the Dallas World Aquarium, the Dallas Arboretum and Botanical Garden and much more to enjoy. Events and special activities are very easy to find in the Southwest Dallas area. Just a few of these include professional sports games, concerts at the AT&T Performing Arts Center, the State Fair of Texas, the Cotton Bowl, the Greek Food Festival of Dallas and much, much more throughout the year. Southwest Dallas, with its competitive real estate prices and ideal location, is superb for all sorts of prospective homebuyers. No matter what type of home you’re looking for, you’re sure to find it in family-friendly Southwest Dallas. 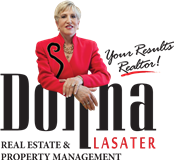 Contact Donna Lasater - Your Results Realtor!